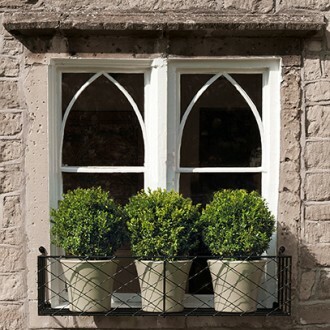 Window boxes are the most convenient way of keeping your floral displays fresh, fed and watered. We can make our window boxes fit any size of window. If your windows are on the first floor or higher, we can make bespoke window boxes to sit within your window reveals that fix sideways into the wall – much easier to fit from inside than perching precariously on a ladder with a drill… Just call us for more details.